The names and accomplishments are forever etched in Bulldog folklore. And now, with one the best coaches in the game, a powerful young running back, and a team stacked with talent, another national title draws within reach. 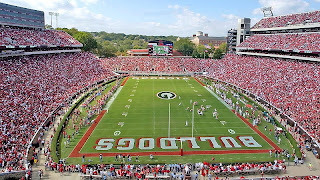 Top Dawg, a new book by Rob Suggs, describes itself as providing the inside scoop on how Georgia seized a place among the college football elite. The book is built around stories of incredible victories, heartbreaking defeats, and quiet acts of integrity, author Rob Suggs writes about one of the proudest programs in the country. The above info is modified from the promotional material sent to me regarding Top Dawg. I haven't read the book yet, but I'm intrigued. Rob is an accomplished / write who bleeds red and black. To help promote the book, Rob has launched the Top Dawg Blawg. He's using the blog to share some stuff in the book and some additional stories not in the book. It's also a great place to share your experiences surrounding some of the big games of Richt's tenure like the Hobnail Boot game. Plus, it's an outlet for Rob to write about the season. Check it out if you get a chance. Seems a bit premature for a Richt success book. Are they going to re-release it 'if' we win a nat'l title?